That the Ottawa Police Services Board receive this report for information. The Police Service has a comprehensive policy that outlines the roles and responsibilities of members with respect to the use of force. The policy addresses training topics, re-qualification cycles, administration of records and reporting on incidents involving use of force. It ensures that the OPS meets the requirements for “Use of Force” set out in Regulation 926 of the Police Services Act as well as the Provincial Adequacy Standards and Police Services Board policy. In accordance with these policies, an annual Use of Force study must be prepared, be reviewed by the Chief and the Board, and be made available to the community. The Report presents statistics on the number of incidents of use of force in 2007, categorized by the levels of force outlined in the Ontario Use of Force Model established by the Province. As required by the above-noted polices, staff are presenting the Report to the Board for review and to make it widely available to the community and other partners. · Formulate and deliver Use of Force Training (UFT). · Analyse each report submitted by officers in every instance in which force is used to ensure it was appropriate. · Based on that analysis, adjust the training curriculum as necessary and/or provide remedial training to individual officers. · Maintain all training records. · Prepare the Annual Use of Force Study. In accordance with the OPS policy, use of force training is delivered in accordance with Provincial Adequacy Standards using the Ontario Use of Force Model (2004). The model indicates the appropriate use of force option based on the situational factors as well as the subject’s behaviour. A diagram of the model is included below. A firearm is drawn in the presence of a member of the public. A firearm is discharged (except during training). An intermediate weapon or weapon of opportunity is used. When physical force is used resulting in injury. The 597 incidents are spread across the categories of physical control techniques (45), intermediate weapons (132) and lethal force weapons (420) as outlined in Table 1. The number of use of force incidents needs to be considered within the operational context of the Police Service. In 2007 there were 1,300 sworn officer positions in the OPS and 271,929 dispatched calls for service. Each category of use of force is discussed in more detail in a following section of the report. Current and historical statistics for the period 2000 – 2007 are provided showing the number of incidents by year. The 2008 Use of Force Report will provide a more fulsome operational context to this data so as to help explain the peaks, valleys and trends in the data. 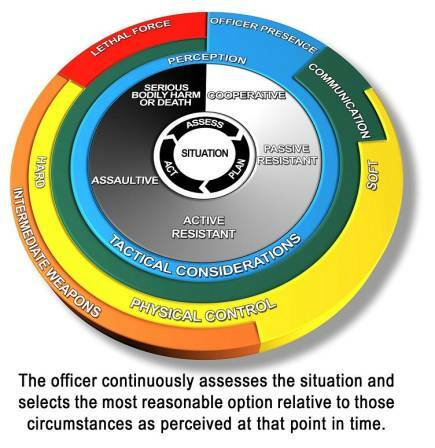 The Ontario Use of Force Model identifies two levels of physical control: soft and hard. In general, physical control means any physical technique used to control a subject that does not involve the use of a weapon. Soft techniques are control oriented and have a lower probability of causing injury. They may include restraining techniques, joint locks and non-resisting handcuffing. A total of 8 incidents were reported in 2007. Hard techniques are intended to stop a subject’s behaviour or to allow application of control techniques and have a higher probability of causing injury. They may include empty hand strikes such as punches and kicks. The statistic for 2007 is 37 incidents. The following graph is a summary of physical control techniques incidents since 2000. It shows that the number of incidents of physical control techniques dropped again in 2007 to a level of 45. At this level it is more in keeping with the pattern that prevailed in the early 2000s. A peak occurred in 2005 when almost 90 incidents occurred. This use of force option involves the use of less-lethal weapons – weapons that are not intended to cause serious injury or death. Aerosol spray, electronic control devices and impact weapons (batons), fall under this heading. Impact weapons can be further divided into soft and hard categories. In a soft manner they are used to assist in restraining an individual who resists arrest. In this capacity they are normally employed as a tool to augment physical control restraint and control techniques. Impact weapons can be used in a hard manner when a police officer or a member of the public, is being physically assaulted. In this capacity, the impact weapon can be used to deliver strikes. Aerosol - Aerosol deployments increased slightly to 54 incidents in 2007, as Graph 2 shows. From 2000 to 2003 the number of aerosol deployments was been on a downward trend, reaching a low of just over 40 incidents. Since then it has been steadily climbing into the range of 50 incidents a year. A peak occurred in 2005 when almost 70 deployments were recorded. Electronic Control Devices - As of November 2007 the electronic control device (ECD) has been deployed to front line supervisors. Prior to that date the Tactical Unit was the only section authorized to used the ECD. As of the end of 2007 there are 61 front line supervisors, 34 Tactical officers, and 11 Professional Development Center Instructors trained in the use of the ECD. Although the ECD has been deployed to more users, the number of incidents is down from previous years. The statistics show that it was used 12 times in 2007. As the graph below shows the number of annual incidents tends to fall between 10 and 15 annually, though 2003, 2005 and 2006 were slightly above those levels. Impact Weapons – In 2007 there were a total of 66 incidents involving impact weapons. No previous year data is available for comparative purposes. Staff uncovered an issue with the tracking of incidents involving batons. The report includes statistics on: 1) officer side arms, 2) carbines and 3) Tactical Section firearms. All 51 incidents of discharges of firearms in 2007 were to destroy animals. The data indicates that officers pointed their weapons at a person 212 times in 2007. In the case of carbines and Tactical firearms, officers at times would not indicate the weapon being drawn since it did not come out of a holster. This resulted in a discrepancy between firearms drawn (157) and firearms pointed (212). Firearms Pointed – In 2007 there were 212 incidents of firearms being pointed at persons. This statistic is lower than previous years. As the graph shows since 2003 the annual level had been more in the range of 250 to 300 incidents per year. It has climbed steadily from a level of 100 incidents in 2000. Firearms Discharged – In 2007 officers discharged their weapons 51 times. In all cases the discharges were to destroy animals. The graph shows that from 2000 – 2004 discharges were in the range of 60 to 70 annually. They hit a peak in 2005 at a level of close to 80 incidents and have dropped down to a level of roughly 50 discharges for 2006 and 2007. By submitting this report with the Board, use of force statistics and background information will be available for discussion with the community and other partners. Use of force reporting is a critical part of the police regulatory environment and a key way to share important information with the community and other partners. Staff will be adding more analysis to the 2008 Annual Use of Force Study so as to provide a more informative operational context to the statistics.